Sr. Eva’s mother died very early and left her two children motherless. Thus her mother’s sister took care of them. 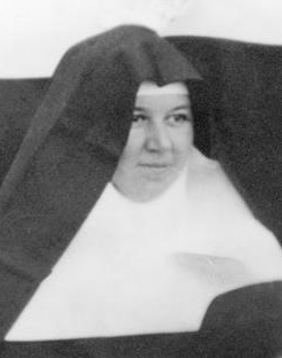 She entered Tutzing Convent and right after her first profession she was missioned to Korea, and from the first sight, she loved Korea very much. By nature she was very gentle and soft, and so, the Novitiate members loved her and followed her like their own mother. Soon after arrival in Wonsan, she became the 3rd Subprioress and at the same time, the Novitiate Directress’s helper. She was busy but she always devotedly took care of all the community members’ wishes and demands. Then, the SinGoSan Station was created and she was sent there to be its 1st Superior. While she was SinGoSan Station Superior, she suffered much because of her ailing heart. However, she didn’t waste any time but taught people to love God. Whomsoever she met, she tried her best to lead them to God. In 1943 she was appointed to be the Superior of HamHeung Station, when everyday living condition got harder because the Japanese took everything for their war cause and now it was close to the end of the war and Japan was losing the War even though no one acknowledged it neither in Japan nor in occupied Japanese colonies. Then, she finished her term of superiorship and came back to Wonsan Priory House and worked in the sewing room. Sr. Eva’s sewing skill was excellent and her talent was well recognized by everyone. Korea was now freed from Japan but became a divided country. The North was under the communist rule, and our Wonsan and its Stations’ living conditions got very bad. The communists came and took all the rice and everything edible. Their living condition was so hard that they sent away the Novitiate members whose family lived around the area. “Are you able to make our clothes?” They couldn’t communicate well because of their language differences. Nevertheless, Sr. Eva understood what they wanted and made some, and these ladies were well satisfied with her beautiful sewing. They all wanted clothes made by Sr. Eva. Thus, Sr. Eva’s income made the Sisters could live normally once again. Sr. Chrysostoma and Sr. Caritas learned the Russian language very fast and helped Sr. Eva’s communication with the Soviet ladies. These ladies were surprised with Sr. Eva’s excellent sewing skill and praised her very much. Oksaduk. At that, Sr. Eva divided her works according to the sewing stages: what she finished; what she was sewing but not finished; and what she couldn’t start to sew; and each with detailed notes and ladies’ names, etc. She earnestly asked the communists to deliver these packages to the Soviet ladies. At such a responsible attitude and caring spirit while she herself was being captured and imprisoned, the communists seemed to be surprised. Sr. Eva had been suffering with her weak heart. With this condition she did her best with the Soviet ladies’ demands of making their worldly clothes, charged with mission spirit since the whole Convent community’s livelihood depended on her sewing income. Now three months of prison life made her extremely weak. Then, the Sisters and others were moved to the hard labor camps. It was August. The summer’s extreme heat and hot sunbeam made their climb in the narrow mountain paths exasperatingly hard. Sr. Eva fainted and Sr. Diomedes gave her the prepared heart stimulant. The head guard let her ride the ox that was carrying their moving luggage. At the camp, she was virtually bedridden but she tried to help whatever she could, getting up with all her might. But her ailment grew deeper and sicker. She was very sick but there was no comfortable place to lay her. Her body was so swollen that she couldn’t move any longer. Even then, she celebrated the Christmas of 1949. In summer of 1950, her body continued to swell in the extreme heat. Sr. Diomedes couldn’t treat her with what the communists gave her to treat her. A week before she passed away, Sr. Eva poked her swollen legs with the sharp edge of the wheat straw and drew out water. The water kept trickling down and, as expected, the poked spots got angry because they were infected. Sr. Eva groaned day and night with high fever and her body became like a fire ball. Sr. Diomedes tried all her skills but there was not much to do. At last, on August 10, 1950, she went to heaven, like St. Laurence who was martyred on the red hot grills, groaning with high fever but praising God while offering herself as a sacrifice to God for her companions on this earth. Her companions in the hard labor camps made a wooden cross and wrote on it some short facts on Sr. Eva as a sign and mark. She lived her professed life of 24 years all in Korea and died at 51 years of age. She left behind her many beautiful life-stories of a saintly person. In the South, we heard of her excellent sewing skills and her precise but humble ways of religious life through the stories told by the Sisters who escaped the communists’ oppression. Thus, the South Korean Sisters who never have been in the North and never seen her, known by heart all the detailed facts about Sr. Eva and other saintly Sisters who went to heaven ahead of us. We want to go to Oksaduk and find the places where Sr. Eva and others were buried, when our country becomes one or we are allowed to enter there. Then, we can bring their remains and bury them in our cemetery on Sasudong hillsides. But for the time being, we erected a small stone monument beside the graveyard of our other Sisters in 2008 and are praying for them all in front of this monument. We think that we are now able to have a blessed and happy religious life here in the South through their sacrifices, martyrdom and noble-minded and loving religious lives.